Disaster Recovery Centers in Gulf and Calhoun Counties are now open. That adds to the list of locations in North Florida where residents can get in-person help following Hurricane Michael. FEMA Disaster Recovery Centers currently open in North Florida. At the centers, known as DRCs, residents can speak with representatives from FEMA, the state, and the U.S. Small Business Administration. They can also get help filing FEMA applications for aid and information about rental and disaster assistance. FEMA’s spokeswoman is Nikki Gaskins. “So we try to encourage people that if they have a need, if they want to check on the status of their application, apply for federal aid, you can go to one of those disaster recovery centers. And you don’t necessarily have to wait for a DRC to open in Bay County for example; you can go to a neighboring county that has a disaster recovery center open," Gaskins says. The center in Calhoun County is in Blountstown at Sam Atkins Park, and the Gulf County location is at the Port St. Joe library. 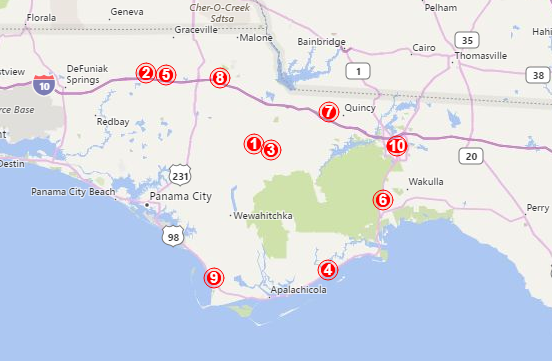 To find the DRCs in other Panhandle counties, visit FloridaDisaster.org. The centers are open Sunday through Saturday from 8 a.m. to 7 p.m. local time. Thursday, November 30 was the final day of the 2017 Atlantic hurricane season. A new book by a former federal disaster inspector might be a good addition to the preparations Florida residents make for next year’s storm season.